Home → Across America → Hurricane Sandy Heading to New Jersey. Stops Big Movie Production. Hurricane Sandy is headed straight for New Jersey and there isn’t a single D-size battery left on the shelf of any supermarket. Wonder Bread is gone and people have to buy the cheaper brands that do not help build strong bodies twelve ways. Milk is in short supply as is bottled water and soda water. One thing that might go unnoticed by the ordinary American is that film production on a long-awaited major motion picture being filmed on the beach in southern New Jersey has to be halted OR SCRAPPED if the storm turns out to be as bad some forecasters predict. Millions of dollars of film that has already been shot will be worthless. 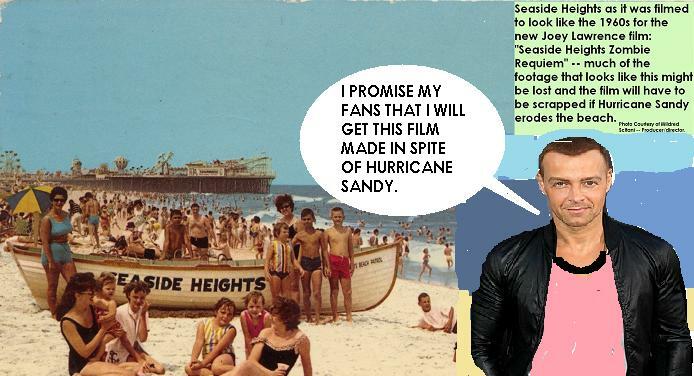 “We have already shot so much of our movie on a stretch of beach between Seaside Heights and Seaside Park, New Jersey,” said Mildred Sclafani, the director and producer of the mega budget film, “Seaside Heights Zombie Requiem. “The forecast is that so much of the beach will be eroded by the storm that a lot of our footage will not match what we have previously filmed. Even if the darker sands show up – the kind that usually come ashore after a major storm — our previously shot footage will be ruined. Sclafani’s reference to “Joey” is the film’s star, Joey Lawrence, who plays the lead role of Slade Giuliano in the film. Joey Lawrence is best known for his TV shows and his recent gig as a male stripper in a Las Vegas Chippendale Show, and this film, with a budget of over $30 million, is by far, the biggest project he has ever worked on — and he’s starring alongside some big names like Ray Liotta, Claire Forlani, Anthony Hopkins to name a few. “Joey is working really hard to make his part work and much of what we shot of Joey was done on the beach. There is some reaction shots we have to do and if the surface of the beach changes, or the landscape is altered by the storm, we will have to either have to resort to someheavy duty computer imagery. I don’t like that because I’m a real-life director and I don’t like the cheesy James Cameron way of filmmaking. Joey is my kind of actor and I worked very hard to make him part of the landscape and this Hurricane Sandy could ruin everything. 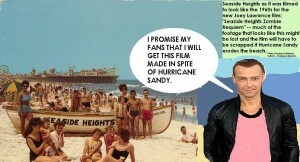 It’s hard to imagine that a hurricane in New Jersey could disrupt the movie-making process, but Hurricane Sandy could cost the production company on “Seaside Heights Zombie Requiem” not only millions of dollars, it might cause the movie to never be made at all and that would be a tragedy because so many Joey Lawrenece fans are banking on this project. Joey has offered to waive his salary if the film is not made, but Mildred Sclafani won’t hear of it. LEFT WING LIE - TAGG ROMNEY AND VOTING MACHINES - NOT TRUE! Governor Christie "Don't Be Stupid" Plans to Fart Into Hurricane Sandy to Save New Jersey.